In September, the first issue of Athenaeum Review appeared in print, featuring articles by Rick Brettell on the Wilcox Space and the Athenaeum, Paul Galvez on “First Sculpture” at the Nasher Sculpture Center, and Charissa Terranova on bioaesthetics. The second print issue will appear in April. Complementing the print journal is a website created by UT Dallas’s own Cassini Nazir. The website includes several online-only features, such as a series of interviews with artists about their work, as well as a podcast series in which artists and scholars discuss their work. Recent guests on the podcast include artist Ludwig Schwarz, and EODIAH guests and fellows such as Linda Dalrymple Henderson, Gregory H. Williams, and Hansong Dan. 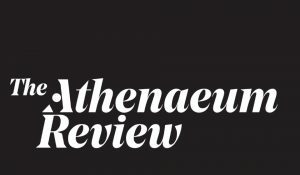 For more information about Athenaeum Review, please contact editor Ben Lima: benjamin.lima@utdallas.edu.